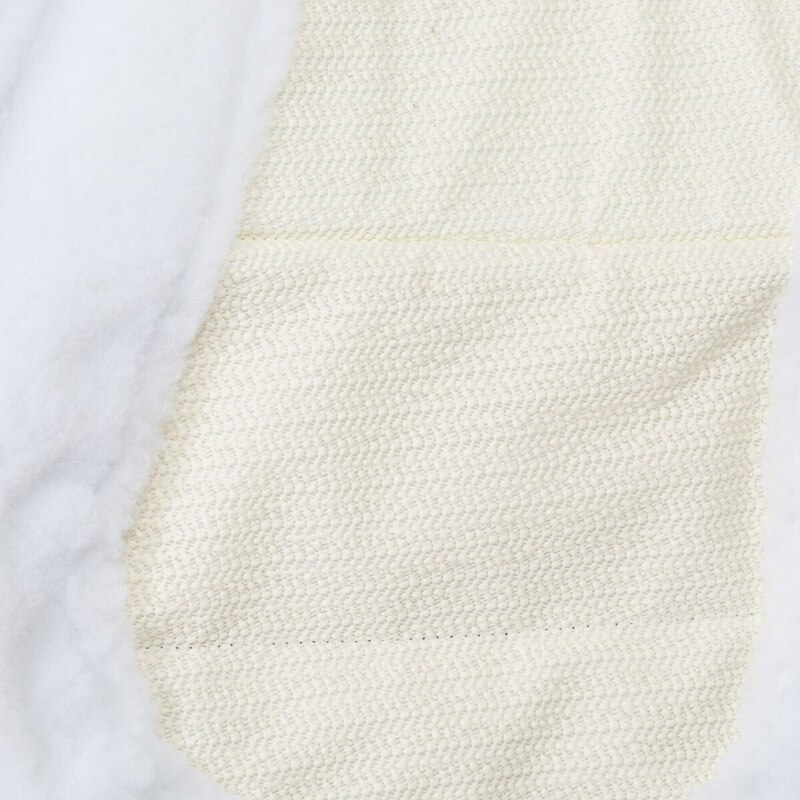 1-ULTRA-GRIP: This breathable non-slip fabric keeps the saddle stable. 3 – LYCRA (underside): This soft high-tech fabric prevents rubbing on the withers. 4- ULTRA-GRIP (underside): Holds the saddle pad in place. Care instructions: Wash in a domestic washing machine with cold water or by hand in warm water and a mild detergent. Hang to dry. Do not put in a dryer. Do not wash with items with hook and loop closures or sharp edges. Do not use chlorine or other corrosive bleaching agents. Spine Measurement: Medium - 19.5", Large - 21"
Drop Measurement: Medium - 18.5", Large - 19"
Spine Measurement Medium - 19.5", Large - 21"
Drop Measurement Medium - 18.5", Large - 19"
EcoGold Stabilizer™ Hunter Pad is rated 4.5 out of 5 by 57. Rated 2 out of 5 by Zoretta from Does not stay put Bought 2 pads, one for each of my show horses. After warming up in the schooling ring, it is necessary to get off and rearrange the pad under the saddle because it slips backwards and bulks up under the saddle on both horses. It is really disappointing, especially at this price point. Needs to have a nylon strap for the girth to fit underneath when connecting to the billet straps of the saddle to prevent slippage. Rated 1 out of 5 by Lazyj from welsh did not approve, want to like it though! I was so excited to try this pad! I love the feel and the lightweight cushion. Something about this pad made my green welsh go bonkers. I’ve used non-slip pads before, no problem. Put this one on and he turns into a bronc. Take it off, fine. I’ve tried everything to get him to like this pad...baby pad underneath, lunging to get him used to the sound of the feel of it. He just won’t have this one certain pad - he’s sensitive to something about it and he usually isn’t picky? Rated 5 out of 5 by Lolatwinkletoes from Pricey But Worth It Being the typical cash strapped rider I tried everything to avoid having to put the cash out for this pad but all I did was waste time and energy. This pad is perfect! Fits my Toulouse saddle perfectly, looks great and doesn’t slip on my round “Thelwell” pony. And I got a discount by being a USEF member! Rated 3 out of 5 by njksterling from Stains easily- shows wear The first time I used this pad, my saddle made a stain on the grip surface (I hadn't oiled it recently). I've washed it according to the instructions but the stains won't come out. In addition to this, the sheepskin mattes and looks very worn after the first 3 uses. I take care of my tack too. I wouldn't recommend this pad for anyone who shows regularly, it won't hold up. Rated 4 out of 5 by Janet from We fox hunt so we are in the saddle a long time, we find the Eco Gold pad is the only pad we have found that does not slip. 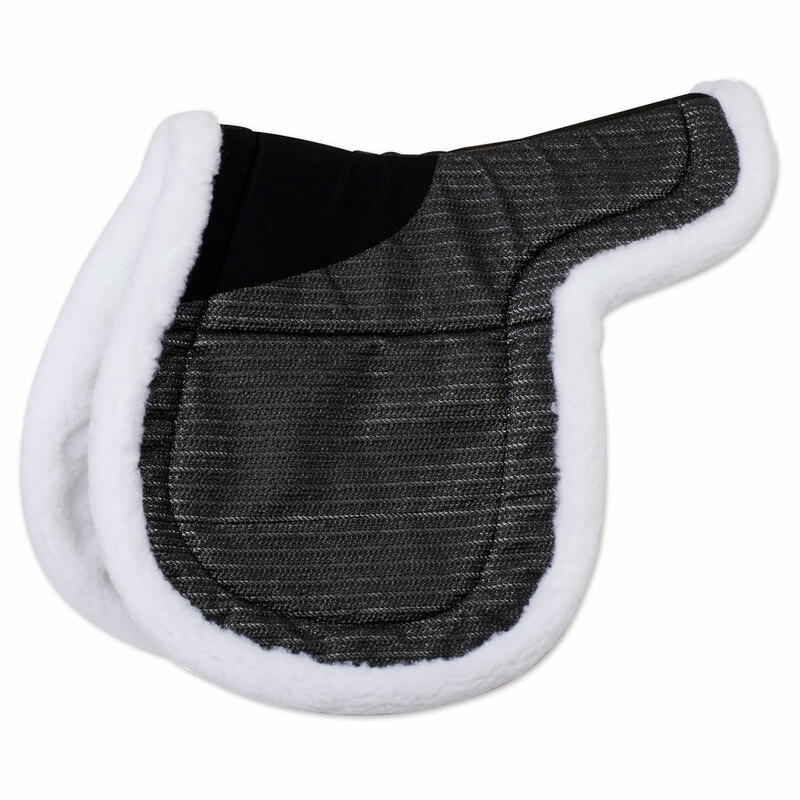 We use it in combination with a foam wither pad to provide optimum comfort for our horses backs. Rated 5 out of 5 by Lizzy from Sticky Durable, thick, no slip. Perfect for biq equitation. Rated 5 out of 5 by horserider from Great Quality I bought this right before one of my shows and it had fitted perfectly. It's looks great and holds up great. I was concerned about the fuzzy part on the outer rim falling off, but it is still extremely stable. Wish that it didn't have padding where the girth was because my girth didn't almost make it. Rated 5 out of 5 by Katie from Glad I finally bought this pad! I never wanted to spend a lot on show pads, thinking the $40 ones were just as good. But they never quite fit around my saddle evenly, and felt like they slipped back even with a non-slip pad underneath. I bought this during the SmartPak sale and was able to use it at a show right afterwards. The quality is terrific - the back has some soft foam padding to it but the sides (under the saddle flaps) are thin for a close contact feeling. It fits my 18" 3AA Voltaire beautifully and evenly all the way around, and is soft and comfortable for my horse. Now it's the only pad I want to use at a show, and my more inexpensive pads are sitting unused. Rated 5 out of 5 by Dylan from Great pad! I have had ecogold products before and this is just another of ecogold's great products. I've had this product for about 3 months now and it is amazing. I've used hunter jumper pads for many years now at horse shows but this is by far my favorite. 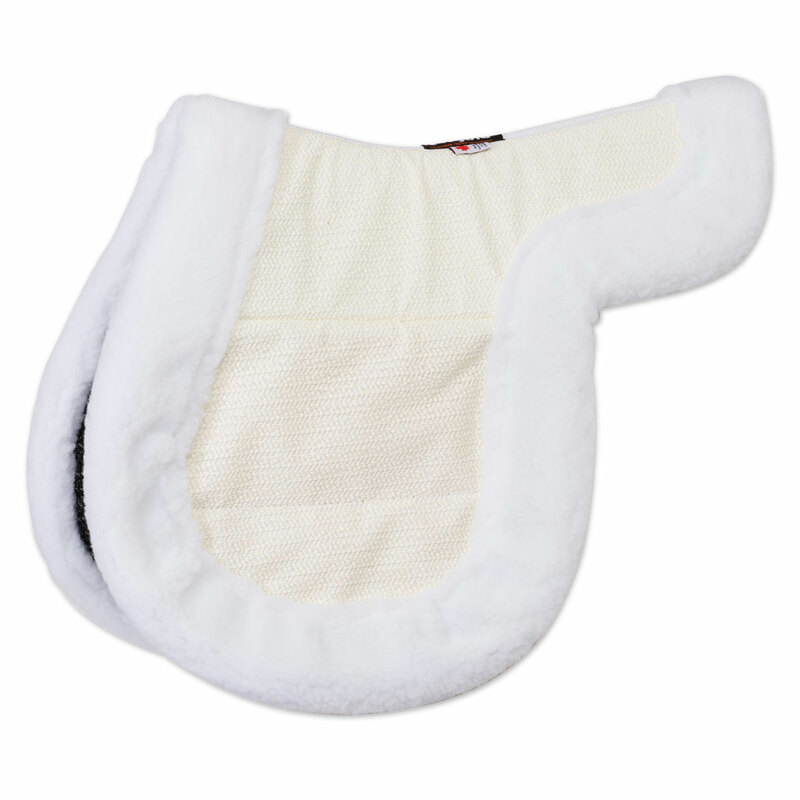 This pad really keeps my horse cool on hot horse show days. Whenever I use this products it never moves an inch! It stays in place very well. All I have to do when it gets dirty is throw it in the washer and it comes out looking brand new again. It also fits my saddle amazing. And provides comfort for me and my horse. Overall a great product.